Tickets Are Selling EXTREMELY FAST - BUY TICKETS NOW! See you & your friends there! Be sure to "Like" & "Share" above to help spread the word!! 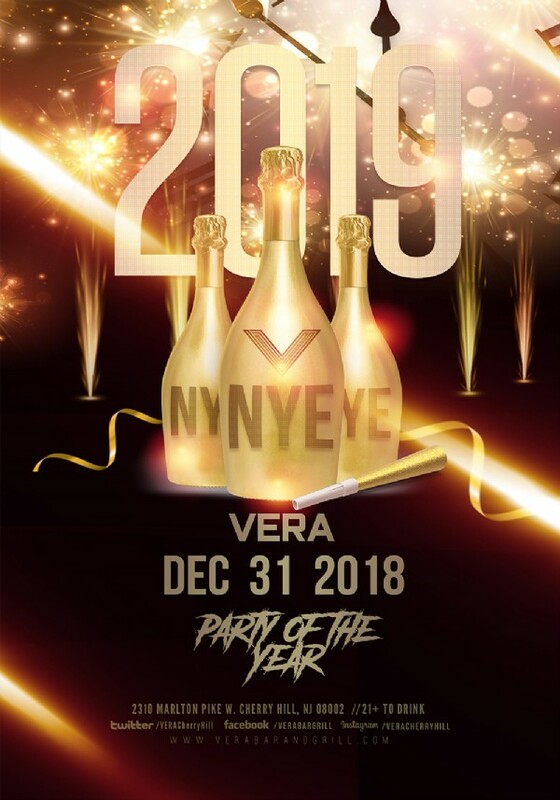 Join Vera Bar & Grill as we countdown to the start of 2019 and party out the last night of 2018 with our amazing New Years Eve Countdown Party on Monday, December 31st! The Night kicks off at 8 pm as the Main room comes to life with great entertainment! Enjoy 3 Different Styles of Music by 3 Separate DJs throughout the building! From the Deck to the Main Stage and the Club, we've got the best music playing all night long! As the time draws closer to midnight, the ball drop will be broadcasted on all screens! Wanting to party well into 2018? Have no fear! 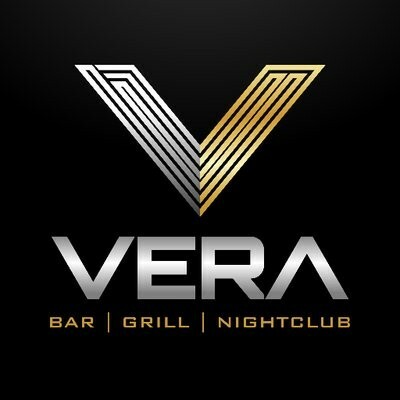 Vera will be open until 5 am, giving you plenty of time to start off the new year with everyone in the club. Get complete access to all the Live Entertainment throughout the venue, both on the Main Floor and up in our Club. Enjoy our Extravagant Buffet up to Midnight, a Champagne Toast as we ring in the New Year with Party Favors, and a Continental Breakfast. Get complete access to all the Live Entertainment throughout the venue, both on the Main Floor and up in our Club. Enjoy a 4-hour All-Inclusive Open Bar from 8pm - 12am with our Premium Liquor (shots are excluded), Extravagant Buffet up to Midnight, a Champagne Toast as we ring in the New Year with Party Favors, and a Continental Breakfast. Get complete access to all the Live Entertainment throughout the venue, both on the Main Floor and up in our Club. Enjoy a 5-hour All-Inclusive Open Bar from 8pm - 1am with our Top Shelf Liquor (shots are excluded), Extravagant Buffet up to Midnight, a Champagne Toast as we ring in the New Year with Party Favors, and a Continental Breakfast. Our VIP Silver Package includes VIP Seating all night long for up to 4 people, one Bottle of Champagne, and a Choice of one Bottle off our VIP Drink Menu, with a choice of 3 Mixers and a Red Bull Bucket to make your night top notch! Enjoy our Extravagant Buffet up to Midnight, Party Favors to ring in the new year, and a Continental Breakfast. Additional Bottles are Available to Purchase. Our VIP Gold Package includes VIP Seating all night long for up to 8 people, one Bottle of Champagne, and a Choice of Two Bottles off our VIP Drink Menu, with a choice of 3 Mixers and a Red Bull Bucket! Enjoy our Extravagant Buffet up to Midnight, Party Favors to ring in the new year, and a Continental Breakfast. Additional Bottles are Available to Purchase. Our VIP Platinum Package is the true king! Enjoy VIP Seating for up to 12 people with a bottle of Moet Nectar Champagne, your Choice of Three Bottles off our VIP Drink Menu, with a choice of 3 Mixers and two Red Bull Buckets! Enjoy our Extravagant Buffet up to Midnight, Party Favors to ring in the new year, and a Continental Breakfast. Additional Bottles are Available to Purchase. **Tax and Gratuity of 25% will be added to all VIP Bottle Service Table Packages and will be charged at your table. 21+ Only, proper ID required. All sales are final, no refunds. Tickets are transferrable to another person. View More Events Organized by Vera Bar & Grill. Brick-lined place offering pub fare & a patio, plus a neon-lit lounge with a lineup of live music. This event is organized by Vera Bar & Grill.